Biotin is a coenzyme for carboxylase enzymes that assist various metabolic reactions involved in fatty acid synthesis, branched-chain amino acid catabolism, and gluconeogenesis important for maintenance of healthy skin and hair. Due to its availability, affordability, and effective marketing for this purpose, biotin is a popular nutritional supplement for treatment of hair loss. However, there are little data on the frequency of biotin deficiency in patients complaining of hair loss and on the value of oral biotin for treatment of hair loss that is not due to an inborn error of biotin metabolism or deficiency. The aim of this study was to determine the frequency and significance of biotin deficiency in women complaining of hair loss. Biotin deficiency was found in 38% of women complaining of hair loss. Of those showing diffuse telogen effluvium in trichograms (24%), 35% had evidence of associated seborrheic-like dermatitis. About 11% of patients with biotin deficiency had a positive personal history for risk factors for biotin deficiency. The custom of treating women complaining of hair loss in an indiscriminate manner with oral biotin supplementation is to be rejected, unless biotin deficiency and its significance for the complaint of hair loss in an individual has been demonstrated on the basis of a careful patient history, clinical examination, determination of serum biotin levels, and exclusion of alternative factors responsible for hair loss. Biotin, also known as vitamin H (the H represents Haar und Haut, German words for “hair and skin”) or vitamin B7, is a water-soluble vitamin of B-complex. 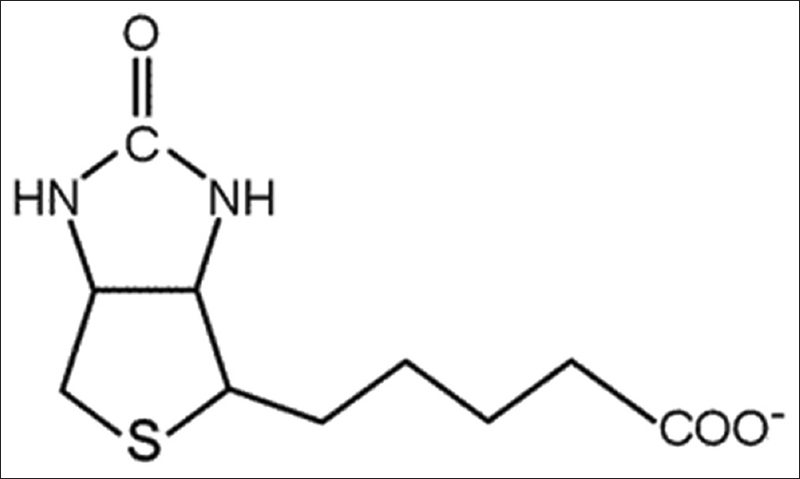 It is composed of an ureido (tetrahydroimidizalone) ring fused with a tetrahydrothiophene ring. A valeric acid substituent is attached to one of the carbon atoms of the tetrahydrothiophene ring [Figure 1]. Biotin is a coenzyme for carboxylase enzymes that assist various metabolic reactions involved in the transfer of carbon dioxide. Biotin is important in fatty acid synthesis, branched-chain amino acid catabolism, and gluconeogenesis. Biotin is often recommended as a dietary supplement for strengthening hair and nails. In addition to being taken as a supplement, many health and beauty products include biotin as an alternative supplement. Ultimately, biotin is found in many cosmetics and health products for the hair and skin although scientific data supporting this outcome are weak. Moreover, it has been demonstrated that proliferation and differentiation of cultured human follicular keratinocytes are not influenced by biotin. The only human health condition for which there is strong evidence of biotin's potential benefit as a treatment is biotin deficiency. Biotin deficiency is believed to be rare though because intestinal bacteria produce biotin more than the body's daily requirements. Moreover, biotin is consumed from a wide range of food sources in the diet although a few are particularly rich sources. 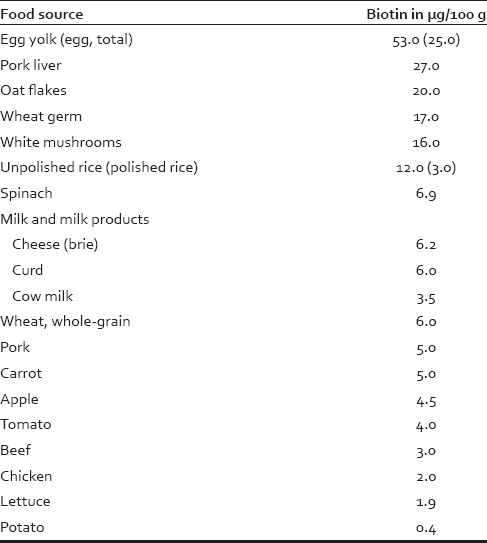 Biotin content in different food sources are listed in [Table 1]. The average dietary biotin intake in Western populations has been estimated to be 35–70 μg/day. For that reason, statutory agencies in many countries do not prescribe a recommended daily intake of biotin. However, a number of metabolic disorders and conditions exist in which an individual's metabolism or uptake of biotin is abnormal. Biotin deficiency can arise due to rare inborn errors of metabolism. These include deficiencies in the enzymes holocarboxylase synthetase (MIM 253270) or biotinidase (MIM 253260). Since endogenous biotin production occurs in the intestine, dysbacteriosis of the gastrointestinal tract (due to inflammatory bowel disease or broad-band antibiotic treatment) could impair the body to generate biotin on its own. The first demonstration of acquired biotin deficiency in animals was observed in rats fed raw egg white. The rats were found to develop dermatitis, alopecia, and neuromuscular dysfunction. The syndrome, called “egg white injury,” was found to be caused by a glycoprotein found in egg white, avidin, that binds extremely well with biotin, making it unavailable for use in enzymatic reactions. Avidin (in egg white) denatures on heating (cooking). The frequency of marginal biotin status is not known, but the incidence of low circulating biotin levels in alcoholics has been found to be greater than in the general population. Smoking may further accelerate biotin catabolism in women. Further, relatively low levels of biotin have been reported in patients on parenteral nutrition, who have had a partial gastrectomy or other causes of achlorhydria, patients on antiepileptics,, patients on isotretinoin for acne treatment, elderly individuals, and athletes. Pregnancy  and lactation may be associated with an increased demand for biotin. In pregnancy, this may be due to a possible acceleration of biotin catabolism whereas in lactation, the higher demand has yet to be elucidated. Symptoms of biotin deficiency include hair loss (alopecia), conjunctivitis, dermatitis in the form of a scaly, red rash around the eyes, nose, and mouth (this has been termed as the “biotin-deficient face” by some experts), and neurological symptoms, such as depression, lethargy, hallucination, and numbness and tingling of the extremities. The neurological and psychological symptoms can occur with only mild deficiencies while dermatitis, conjunctivitis, and hair loss generally occur only when deficiency becomes more severe. Individuals with hereditary disorders of biotin deficiency additionally have evidence of impaired immune system function, including increased susceptibility to bacterial and fungal infections. Regardless of the cause, the deficiency can usually be addressed directly with nutritional supplementation. The aim of this study was to determine the frequency and significance of biotin deficiency in women complaining of hair loss. The patient histories of female patients who consulted the Center for Dermatology and Hair Diseases Professor Trüeb, in the year 2014 with the complaint of hair loss and in whom serum biotin levels were performed were studied retrospectively. Serum biotin levels were performed on 541 female patients aged between 9 and 92 years (mean: 45.9 years). 75 women who had already been taken 5 mg oral biotin at the time point of the consultation were excluded from the study. They all had biotin levels >1000 ng/L. Since biotin levels < 200 ng/l are considered as biotin deficiency, and serum biotin levels demonstrate daily fluctuations in the magnitude of up to 100 percent, for practical purposes levels <100 ng/l were considered deficient, between 200–400 ng/L as suboptimal, and >400 ng/L as optimal. The groups (biotin deficient and optimal biotin levels) were compared with respect to the results of the trichogram, associated seborrheic-like dermatitis, and patient history for risk factors for biotin deficiency (gastrointestinal disease, medication with isotretinoin, antibiotics, or antiepileptics). The results are summarized in [Table 2]. The quantity and quality of hair are closely related to the nutritional state of an individual. Normal supply, uptake, and transport of proteins, calories, trace elements, and vitamins are of fundamental importance in tissues with a high biosynthetic activity such as the hair follicle. In instances of protein and calorie malnutrition and deficiency of trace elements and vitamins, hair growth and skin health may be impaired. Since a substantial commercial interest lies in the value of nutritional supplements for the growth and health of hair, an important question that arises is whether increasing the content of an already adequate diet with nutrients may further promote hair growth. Pharmacy aisles and Internet drugstores are full of nutritional supplements promising full, thick, luscious hair for prices that range from suspiciously cheap to dishearteningly exorbitant. The fact is that unless hair loss is due to a specific nutritional deficiency, there is only so much that nutritional therapies can do to enhance hair growth and quality. In general, malnutrition is due to one or more of following factors: Inadequate food intake, illness that causes increased nutrient requirements, increased nutrient loss, poor nutrient absorption, or combination of these factors. Due to its availability, affordability, and effective marketing for this purpose, biotin is a popular nutritional supplement for treatment of brittle nails and hair loss. Moreover (in contrast to other nutritional supplements, such as vitamin A, selenium, iron, and zinc), there is no known toxicity of biotin in an order of magnitude greater than of the nutritional requirements. There are no reported cases of adverse effects from receiving high doses of the vitamin, in particular, when used for treatment of the inborn errors of biotin metabolism in infants (10–30 mg daily). While response of splitting brittle nails (onychoschizia, onychoschisis) to daily biotin supplementation, irrespective of serum biotin levels, has been demonstrated,,,,,, there are little data on the frequency of biotin deficiency in the general population and in patients complaining of hair loss and on the value of oral biotin for treatment of hair loss that is not due to an inborn error of biotin metabolism or acquired biotin deficiency. Recognized risk factors for biotin deficiency from patients' personal history are gastrointestinal disease (inflammatory bowel disease) or intake of drugs interfering with biotin metabolism or uptake (antiepileptics, antibiotics, or isotretinoin). Cutaneous manifestations of biotin deficiency are hair loss and seborrheic-like dermatitis. Blood levels of biotin show a wide variability ranging from 400 to 1200 ng/L with daily fluctuations in the magnitude of up to100%, which is why at least two determinations on 2 different days are recommended. The most reliable detection method of biotin deficiency is elevated excretion of 3-hydroxyisovaleric acid in the urine (>195 μmol/24 h). Using this method, it has been demonstrated that a daily allowance of 30 μg is sufficient to provide normal excretion levels of 3-hydroxyisovaleric acid in the adult. A practical approach to determine biotin status in relation to serum levels is to classify into optimal levels (>400 ng/L), suboptimal levels (100–400 ng/L), and deficiency (<100 ng/L). Of the women complaining of hair loss assessed for serum biotin levels, 38% had values consistent with biotin deficiency (<100 ng/L) and 13% optimal (>400 ng/L). In the women in whom trichograms were performed, both groups (biotin deficiency and optimal levels) demonstrated diffuse telogen effluvium in 24%. Therefore, the trichogram is not helpful in detecting hair loss relating to biotin deficiency since it is neither sensitive nor specific, with telogen effluvium in women usually being of multifactorial origin. Rather, associated seborrheic-like dermatitis found in 35% of women with serum biotin levels <100 ng/L and telogen effluvium versus 0% of women with optimal biotin levels and telogen effluvium in trichograms, may point to significance of biotin deficiency. Finally, the patient's history may be helpful in detecting biotin deficiency, though with low sensitivity, since in the biotin deficiency group 11% (eight inflammatory bowel disease, six isotretinoin treatment, six antibiotic treatment, and one antiepileptic treatment) versus 1.5% in the group with optimal biotin levels (one on antibiotic treatment) presented with a history of risk factors for biotin deficiency. The custom of treating women complaining of hair loss in an indiscriminate manner with oral biotin supplementation is to be rejected unless biotin deficiency and its significance for the complaint of hair loss in an individual has been demonstrated. It must be kept in mind that hair loss in women may be of multifactorial origin, including female androgenetic alopecia, other nutritional deficiencies (e.g., iron deficiency), and/or endocrine disorders (e.g., thyroid disorder). 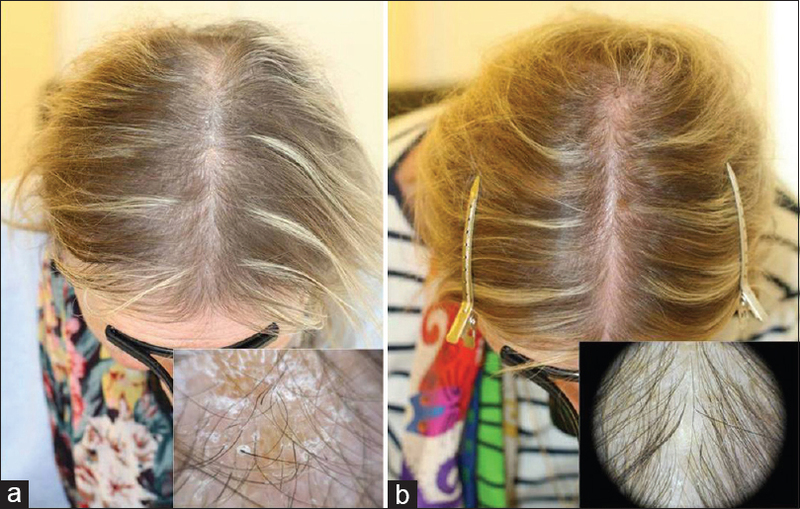 Treating the patient exclusively with oral biotin poses the risk of neglect or delay of appropriate treatment of hair loss in the particular case. Rather, a careful patient history and clinical examination with respect to risk factors for biotin deficiency (gastrointestinal disease, medication with isotretinoin, antibiotics, or antiepileptics) and associated symptoms (seborrheic-like dermatitis, neurological symptoms) must be performed. When biotin deficiency is suspected, the serum biotin level must be determined, and in case of biotin deficiency (<100 ng/L), the cause must be sought (unless obvious from the patient history) and treated. Regardless of the cause, the deficiency can usually be successfully addressed directly with nutritional supplementation with usually high bioavailability of oral biotin supplements usually in a dosage of 5 mg/day [Figure 2]a and [Figure 2]b. At the same time, potential additional causes of hair loss, for example, androgenetic alopecia, other nutritional deficiencies, and endocrine disorders, must systematically be addressed and treated as needed. The high percentage of marginal biotin levels in this study may reflect that a number of other factors may contribute, such as anorexia/bulimia, alcoholism, smoking, pregnancy, lactation, athleticism, and old age. Finally, a wide variability in biotin bioavailability from foodstuff may be due to the ability of an organism to break various biotin-protein bonds from food. This study was performed with the support of Merz Pharma (Schweiz) AG. Limat A, Suormala T, Hunziker T, Waelti ER, Braathen LR, Baumgartner R. Proliferation and differentiation of cultured human follicular keratinocytes are not influenced by biotin. Arch Dermatol Res 1996;288:31-8. Prendiville JS, Manfredi LN. Skin signs of nutritional disorders. Semin Dermatol 1992;11:88-97. Zempleni J, Hassan YI, Wijeratne SS. Biotin and biotinidase deficiency. Expert Rev Endocrinol Metab 2008;3:715-24. György P, Rose CS, Eakin RE, Snell EE, Williams RJ. Egg-white injury as the result of nonabsorption or inactivation of biotin. Science 1941;93:477-8. Subramanya SB, Subramanian VS, Kumar JS, Hoiness R, Said HM. Inhibition of intestinal biotin absorption by chronic alcohol feeding: Cellular and molecular mechanisms. Am J Physiol Gastrointest Liver Physiol 2011;300:G494-501. Sealey WM, Teague AM, Stratton SL, Mock DM. Smoking accelerates biotin catabolism in women. Am J Clin Nutr 2004;80:932-5. Mock DM, Baswell DL, Baker H, Holman RT, Sweetman L. Biotin deficiency complicating parenteral alimentation: Diagnosis, metabolic repercussions, and treatment. J Pediatr 1985;106:762-9. Greenway FL, Ingram DK, Ravussin E, Hausmann M, Smith SR, Cox L, et al. Loss of taste responds to high-dose biotin treatment. J Am Coll Nutr 2011;30:178-81. Mock DM, Dyken ME. Biotin catabolism is accelerated in adults receiving long-term therapy with anticonvulsants. Neurology 1997;49:1444-7. Schulpis KH, Karikas GA, Tjamouranis J, Regoutas S, Tsakiris S. Low serum biotinidase activity in children with valproic acid monotherapy. Epilepsia 2001;42:1359-62. Schulpis KH, Georgala S, Papakonstantinou ED, Michas T, Karikas GA. The effect of isotretinoin on biotinidase activity. Skin Pharmacol Appl Skin Physiol 1999;12:28-33. Mock DM, Quirk JG, Mock NI. Marginal biotin deficiency during normal pregnancy. Am J Clin Nutr 2002;75:295-9. Seymons K, De Moor A, De Raeve H, Lambert J. Dermatologic signs of biotin deficiency leading to the diagnosis of multiple carboxylase deficiency. Pediatr Dermatol 2004;21:231-5. Floersheim GL. Treatment of brittle fingernails with biotin. Z Hautkr 1989;64:41-8. Colombo VE, Gerber F, Bronhofer M, Floersheim GL. Treatment of brittle fingernails and onychoschizia with biotin: Scanning electron microscopy. J Am Acad Dermatol 1990;23 (6 Pt 1):1127-32. Iorizzo M, Pazzaglia M, M Piraccini B, Tullo S, Tosti A. Brittle nails. J Cosmet Dermatol 2004;3:138-44. Scheinfeld N, Dahdah MJ, Scher R. Vitamins and minerals: Their role in nail health and disease. J Drugs Dermatol 2007;6:782-7. Cashman MW, Sloan SB. Nutrition and nail disease. Clin Dermatol 2010;28:420-5.